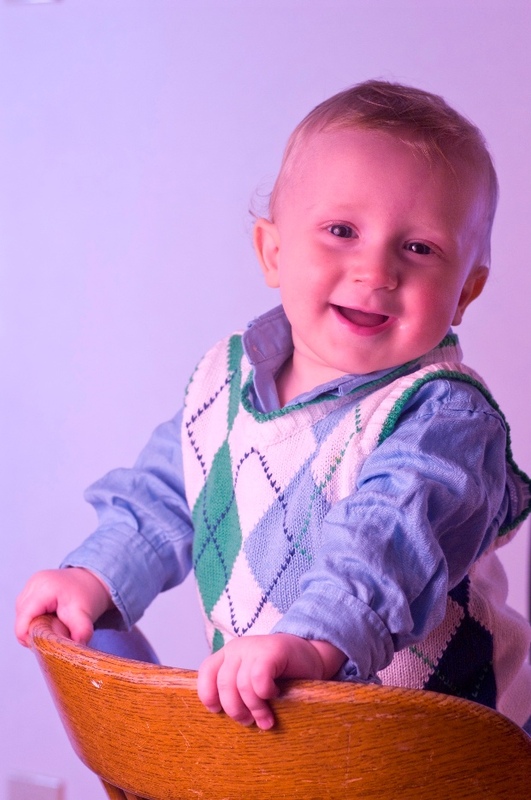 Ellen Venner-Hiltz knew her two-month-old son wasn’t focusing as well as her other children had, but when she lay Griffin next to his newborn cousin, the difference was obvious. Her week-old nephew looked steadily at objects, but Griffin’s eyes were darting around, as if he couldn’t decide what to look at. His eyes were unsteady and shaking, something they would later learn was nystagamus, just one of a host of eye problems caused by his ocular albinism. “I think he’s blind, he’s really not seeing me,” her husband, Dartmouth dentist Greg Hitlz, told her. They asked Griffin’s paediatrician to take an extra look.The pediatrician immediately noticed something wrong. Sunlight was shining in from an open window in the practice and she caught a glimmer of red in the retina. It was then she realized Griffin didn’t have pigment in the back of his eye. Around this same time, in early 2006, Venner-Hiltz took her daughter Madeline, who had just turned three, for her first eye exam. The optometrist, Dr. Ralph Rosere, noticed something wrong with her eyes as well. “He said to me ‘I think I’m seeing some strange mottling in the back of her eye…do you have a family history of ocular albinism?’ I had no idea what he was talking about,” Venner-Hiltz says. Even with a background in special education and two kids under her belt, Venner-Hiltz says nothing prepared her for what lay ahead. The family was immediately referred to the pediatric ophthalmic team at the IWK, the children’s hospital in Halifax. What they learned was Griffin had x-linked ocular albinism, a genetic disorder he inherited from his mother, and that Madeline was a carrier. They have since learned their youngest child, one-year-old Broden, is also affected, though it’s too early to tell how severely. 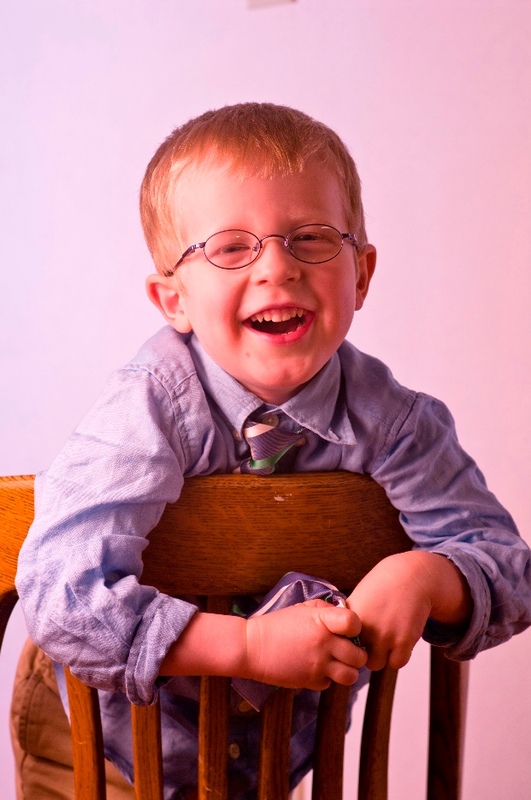 Griffin, and to some extent his family, have been followed by the eye team at the IWK ever since. The team consists of a pediatric ophthalmologist, a number of students, an orthoptist, an electrodiagnostian, various technicians and, when necessary, a genetic counsellor. Because the emergence of the condition is unpredictable and because it has been difficult to get a handle of the true range of his vision, Griffin has been seen regularly since his initial diagnosis.His development is watched closely in case surgical correction becomes and option and he visits the low vision clinic where he is learning to use tools that help with activities like reading and watching TV. According to the National Organization for Albinism and Hypopigmentation (NOAH) ocular albinism affects one in 150,000 males. (Only males develop ocular albinism, but females can pass the gene on to their children.) People with ocular albinism can experience congenital nystagmus, reduced visual acuity (from 20/60 to 20/400, sometimes as good as 20/25 in people of African descent), hypopigmentation of the iris pigment epithelium and the ocular fundus and foveal hypoplasia. Significant refractive errors are also common, as are reduced or absent binocular functions, strabismus and photoaversion. Now nearly four, Griffin is quite a contrast in behaviours. He is naturally a sunny, happy child who loves people and, despite his vision problems, is good at puzzles and is fascinated by toys with small pieces. The eye issues are ever present however. Because of them, Griffin gets frustrated and is often tired, making even simple tasks difficult for the whole family. Selecting a favourite toy before a car trip can leave Griffin in tears, Venner-Hiltz says. In the rush to get out the door, it’s easy to forget Griffin may not even be able to see his special teddy bear. Griffin’s repeated eye exams also wear on him. During a routine exam last year, Griffin was asked to identify shape after shape as the technicians tried to assess his eyes. He had done the tests before. He was bored and tired. As a tantrum set in, a technician made the mistake of getting down too low in her attempts to cajole him, and was kicked in the face. There was no major damage to the technician, who was used to working with children. Still, Venner-Hiltz laughs at the memory the “very difficult” note that went on her son’s file. While she laughs now, Venner-Hiltz is frustrated by the shortage of pediatric ophthalmologists at the IWK, means long wait times and little chance to get her questions answered. It’s meant keeping Griffin at the clinic through nap time and snack time, raising stress levels and the likelihood of tantrums. They now ask for earlier appointment times to accommodate naps and meals, and have asked for less student involvement while he is still so young. She says the eye team has been very accommodating and the changes have made Griffin a much more pleasant patient. For its part, the IWK understands the Hiltz family’s frustrations. The hospital has been scouring the world for another pediatric ophthalmologist. The problem is not limited to Nova Scotia. Dr. Robin Walker, vice-president of medicine at the IWK, says the specialty is a very small one and Canadian schools aren’t training as many as are needed. “We know there is no one in Canada right now who’s trained and available,” he says. The hospital also admits the impact on patient care is not good. The current specialists are left to triage the young patients and only see the worst cases, referring the rest to waiting lists or community optometrists or ophthalmologists. “You always worry that there’ll be something missed, that some child that presented with something that looks very minor that can wait will turnout to have a eye tumour or something catastrophic like that. It’s going to be very rare, but something like this is going to occur,” Dr. Walker says, noting that many specialties face these problems. All the same, “it just feels worse to recognize you are having to treat children in this way,” he says. Dr. Ian MacDonald, chair of ophthalmology at the University of Alberta, says the condition in an affected male is fairly apparent, but picking it up in women can be trickier. “In the female carrier there may be some signs,” he says. “The carrier would have some lack of pigmentation in the back of the eye.” Depending on the overall pigmentation, female carriers may show iris translucency and a patchy hypopigmentation or a grayish ‘mud-splattered’ discoloration of the peripheral fundus. Dr. MacDonald adds it’s important for the affected patient to be referred for genetic counselling. Jill Beis, a genetics counsellor at the IWK, agrees. Because ocular albinism can have a generational impact, Beis says, “I think it would be a useful thing to refer that person to say ‘if this is a sign that you are a carrier of ocular albinism here is potentially the risk to your children and if you have children now maybe they should go for a screening.’” The gene mutation is found on the X chromosome. A boy born to a female carrier will either be affected or unaffected, while a girl can be unaffected or become a carrier. Any girls born to an affected male will be carriers, but none of the males will be affected. Venner-Hiltz says knowing she was a carrier wouldn’t have changed her decision to have kids, but understanding the implications before hand would have made Griffin’s diagnosis much less difficult. Her fourth child is also affected, and understanding the condition has made things less stressful. The Hiltz children are a rarity with three out of the four either affected or carriers of ocular albinism, but their mother says they’re thriving. Griffin finished his first year of pre-school. A bit of extra time with a book before story time helped, as did sitting directly in front of teacher as she read. Now he’s learning to use the visual aids he will need for school, and Venner-Hiltz is even getting him ready for the French school his siblings attend. Visit www.opticalprism.ca for links to resources for patients with ocular albinism.